Creative Meanderings: Yes I am still alive !!! I must apologise for my absence but the truth is I had nothing to show you. My muse is still on holidays-heaven knows where-but if you see it please send it home to me I need it. I think all the rain we have been getting has well and truly dampened my spirits (pardon the pun) but I have not wanted to do any stitching or creating of any kind. I have been reading blogs but not commenting and I do apologise for that as well I just found it all too hard. Hopefully I will improve in the future. 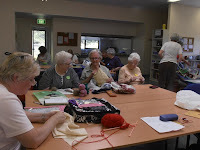 So here is a photo--not of me being creative but of the ladies who came to our second craft day at our church-there were 16 ladies who were doing a lot of different crafting and even more talking and the decision was made to run the group twice a month instead of once a month. They are all so eager to get together and learn from each other it is wonderful. 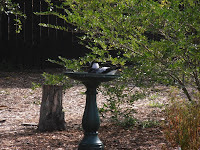 This next photo is of two of the many magpies that call our back yard home. Stephen and I were sitting in the kitchen having some morning tea and I noticed something move in the back room. To our surprise two of the magpies had trotted in through the back door having a sticky beak and I suspect that they would have entered further if we hadn't been in the kitchen. Would this be classed as a home invasion? The one closest to the camera was having a chortle at us by this stage. 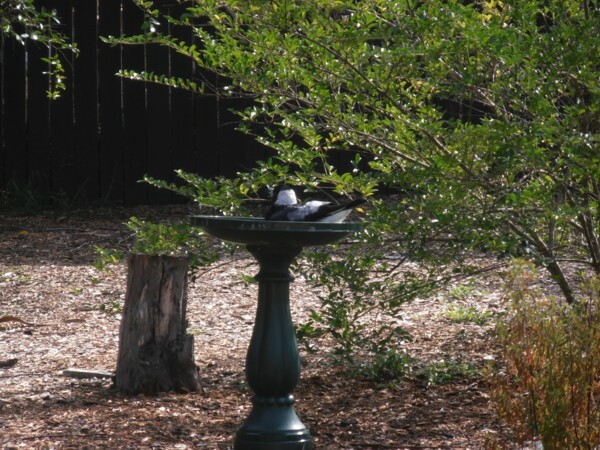 They then flew out into the back yard and had a bath in our bird bath----ahh what a life. Well I will try and do something creative----soooon--but please don't put a time on it I would hate to let you down. The craft group you started seems to have hit a chord. I hope you find your muse again soon. It is so frustrating to be spinning your wheels when you know that there are things you'd like to be doing - if only you could figure out what they are. But your muse is probably in need of a rest - you give it a pretty good workout most of the time. We all need a break sometime, and it is good to get away from the computer for a while....hope you find your muse soon, I miss seeing your lovely work. There seem to be a lot of people who are lacking inspiration at present. I imagine all that water is enough to cause a lack of enthusiasm. Take it easy and just post when you feel like it. 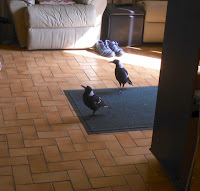 The magpies are really friendly - I think the ones that hang about here would come inside if I left the door open. Love the group photo - it's good to work in a group sometimes. Your muse will return Doreen - it happens to us all, and when the right time arrives you'll be up and running again. Cheeky magpies - ours aren't as brazen as that, though they do pinch most of the bird food we put out. No problem, just take your time. i know of this inspiration fairy holidays! Very cheeky magpies. I'm sure your muse will return in time, perhaps with the sun, in the meantime enjoy your craft meetings. Hope your inspiration muse doen't take too long a vacation ss your posts of your lovely work are encourageing to see. I'm not surprised you've burnt yourself out after that whitework stuff - I would have gone nuts! Cute maggies - they visit us when the Lorikeets and Galahs aren't around to chase them off. For big birds, the magpies are surprisingly timid of other birds. Glad you are well, and just recharging your batteries. Those magpie's are cute, and a little bold. When I get 'out of sorts' creatively, I try playing with my stash. If that doesn't get me going on a project, then I go window shopping and blog hopping. I usually see something to spark an idea. I'm sure you'll be back to your creative 'normal' soon. Doreen, I've been where you are and it's no fun. But your muse will return and before you know it you'll be creating something beautiful that will make us all sigh with delight. We once had a squirrel that would come into the house if we left the patio door open. Your birds seem to be doing the same. We visit your blog to hear about your life and not just to see your art my friendxx. Am sure your muse will return - and hopefully your magpie friends too! Nice to see the photo of my relatives! Sorry your creative mojo is taking a leave of absence - don't rush it because it will come back when it's ready.